I’m awake and staring at the stars from my little platform looking for a shooting one as a good omen for my day. Star sighted, I pack up my things in the dark, wander down the road to the kiosk where Turtle meets me and we make coffee with a hiker box fuel cannister. Fruit is always a luxury when hiking (or fresh anything) so I’d packed an apple in this drop that I ate before we headed off down the chilly dark trail just after 6am. A high rock wall appears in the shadows next to us which looks extra spooky and impressive in the dark. 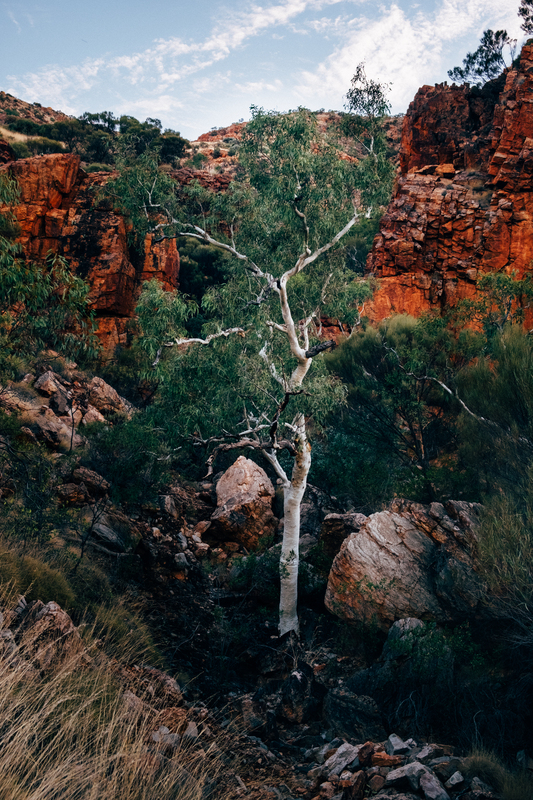 I give it a hug, in an attempt to connect with some of it’s ancient wisdom (yes, I hug trees too) and we continue through a dry deep sand riverbed before climbing up the hills as the first light begins to shine. Mount Sonder is still in the distance, but ahead we have spectacular canyons and white gums glowing in the early light. Superb layers of orange and red rock are stacked up to form huge towering walls that would be an awesome waterfall in the wet season. We whistle the Jurassic Park theme song as I’m pretty sure there are some dinosaurs about to emerge from the boulders. We vow to return via helicopter after the rains begin! Underfoot is a gorgeous dark iron rock that reminds me of lava fields but is less porous, so we decide the black layers must just be old oxidation of the iron rocks. We are walking through some scraggly burnt trees when Jack catches us and zooms ahead. This is so far my absolute favourite day! Our climb to Mt Giles lookout begins after 8km and is a lot less steep than I anticipated. It is still a hard climb, more so towards the top, and the views are insane. The landscape is getting more and more dramatic and I’m so excited when I realise we are hiking across the top of this narrow ridge with mountains either side. I don’t want this part to end, except that the sun is well and truly up and burning fiercly so we don’t stay the top but begin the very steep very rocky descent. The land falls away veeeery steeply and I can see where our lunch spot must be in the distance, hiding in a gorge far below. Down Down Down. The ground is really hard underfoot and the trail is very tricky. My poles go away and my hands come out a lot to lower me down huge steps and navigate around large boulders. A group of supported hikers pass us in the most inconvenient place possible on the trail- they are hiking opposite direction but the same distance as us today without any packs! They are still making amazing time though. As he passes, the group leader admires our Dirty Girl Gaiters and my homemade anti-desert-spikything-leg-protectors that I made for the CDT last year that are still serving me well! Finally finally at the bottom. Sweaty and hot. Feet throbbing from the pounding down the steep steps and all I want is lunch! It is not to be. Instead we hike through a rocky canyon that is actually really fun jumping up and down and around huge boulders. It’s choose your own adventure hiking, where every step is a puzzle piece towards finding the trail. I spy shade! Shade! Glorious shade. The foot of waterfall gorge campsite is a perfect shaded piece of staggered rock that is like a mini ampitheatre. Shoes and socks come off and I elevate my hot feet, the rock nice and cool on my legs. The usual lunchtime rush ensues with eating, drinking electrolytes, retaping feet, applying suncream, refilling snack pockets and topping up my hydration bladder with the extra water I have. It’s a hot day with no water sources so I’m carrying 5L that I’m doing my best to ration. Out of the gorge we enter a vast pastel valley with a pass way down the end that we are to climb up and over. The spinifex covering the slopes looks like little soft green cotton balls, but is mean and spiky and stabs us all day long. More beautiful red rock sits at the top of the green slopes with amazing trees finding purchase in little ledges and cracks. The other side of the pass is even more spectacular. There is, however, no respite from the heat until we are up and over the pass. I find a little burnt out area with some tree coverage that looks non-snakey that I sit down in and enjoy 5 minutes (or maybe it was 10) of non-foot pounding where Turtle joins me. A piece of red licorice and a sip of electrolytes and we are back on our feet and around the corner into a new canyon. This Inarlanga Pass. It starts like the first canyon with big white, black and pink hued boulders, then turns into an orange fantasy land. The walls are fluro orange towering high above us, the ground is dotted with ghost gums and huge cycads, and the boulders are big and tricky to get around. The cycads are phenomenal relics of long ago. Until recently it was thought the West Mac cycads were around during the Jurassic period, making our Jurassic Park whistling this morning quite appropriate! But recent studies show they have “only” been around for about 10 million years. I’m pretty sure that still warrants some admiration! Hiking poles go away and hands come out as we slide and scurry and edge our way through. My feet are so sore after spending all day on hard rock, but the hiking spectacular so I command my feet to take a few spoons of concrete. Towards the end of the canyon the fading light of the day hits the top of the rock walls, making them glow even more. Finally out the other side I find a sign that explains that this is the pass between the lands of two different people. I’m at the junction to the Ochre Pits which is a registered sacred site and still used today by the Arrernte people – they don’t access the pass without the permission of the traditional custodians of the land on the other side of the pass. the light is well and truly fading now. The sky is gorgeous tonight and we turn a corner to unexpectantly find someone watching the sunset with his camera and no other gear. Turns out he is camping at the same place as us and has hiked up to view the sunset. The last km takes forever. It is way more than 1km and we swear at the sign! Mean sign. There are a lot of tents set up, so we cross over the creek bed and find some flat spaces on the other side next to the water tank where Jack has already set up. I lay out my tyvec, blow up my mattress and fluff out my quilt, then wander over to our “dining room” (rocks big enough to sit on to eat dinner) where Turtle and I eat yummy food by the light of our headlamps. I fill up my water ready for tomorrow then scurry back to my fluffy quilty home for the night. It doesn’t take long for me to fade away into sleep, but am rudely awakened by something walking around close by. The night is so quiet it’s easy to hear, and my spidey senses are all on alert. I shine my headlamp into the trees next to my bed and am greeted by two eyes staring back at me. Bloody dingo. It scampers off and I sit up trying to see where it went, before giving up and lying down again. 5 minutes later it is back. GAH. I don’t want to be woken up by an exploratory sniff to my head, so I pull my tarp out and set it up super quickly. The beauty of a tarp is that I don’t have to move any of my things, but just erect it around me and am super impressed with how quickly and well I set it up. No adjustments required, perfect first go. This never happens and I am tempted to wake everyone up so they can give me a medal for Perfectus Tarpus Erectus. I self high five instead, and lie down in my mini house. I’ve got the little doors rolled up so I still have glimpses of my star friends, and hope they don’t do anything too amazing tonight that I miss. Goodnight stars! Goodnight dingos!